Inflation Expectation Up 60% In 6 Months. It wouldn’t be fair to say that Bernanke is responsible for all the run-up in global food prices. There are many factors at play. That’s not to say the US monetary policy doesn’t have a central role in the global commodities market. The Fed has a big axe. Policies like ZIRP and QE encourage speculation. It’s contributing to overheating in a number of countries, this is adding to demand at every level. How much can we blame Bernanke for the increases in global food/commodities prices over the last year or so? My guess is about 25%. I would make a similar argument for the stock market. Ben’s cheap money has added to equity values. But he can’t take all the credit for high stocks. I would give him kudos for about half of the fluff since the summer. This looks back a few years. We are at the “wides”. Bernanke can dodge a lot of things. He can’t dodge this. He might even celebrate this by pointing to it and saying, “Look what I have brought you!” “This is a greater measure of my success than the move in the S&P!” And that will hang him. Inflation expectations based on the Tips market have widened from 151 to 241 in just six-months. That comes to a real 60% increase. Inflation expectations have been rising by about 10% a month. Is there any wonder why global food supplies are getting short if key barometers on future inflation are in high gear in the USA? If expectations are rising 10% a month here, they are rising at 20% (or more) in dozens of countries around the world. A friend points out another way to look at the 2s vs 10s . The 280 number stands out (pushing the highs). Put that number into perspective. If you had a hundred G’s of spare cash you could eek out $3,360 bucks a year by putting it to work in the ten-year. If you were afraid of where rates are headed and just park it in the two-year you get a lousy $580 return. In order to get 3,360 of income you have to come up with 570,000 big ones. 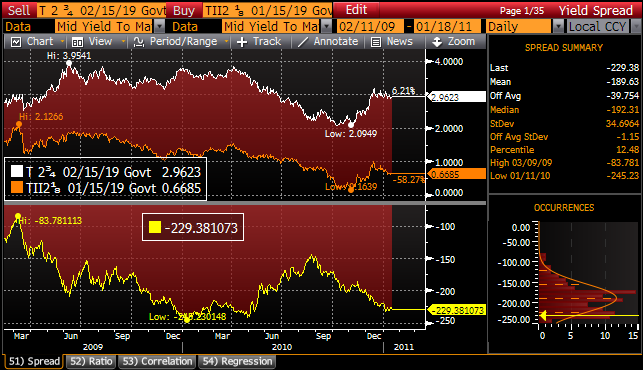 The yield on the 10’s is 6X’s richer than 2’s. 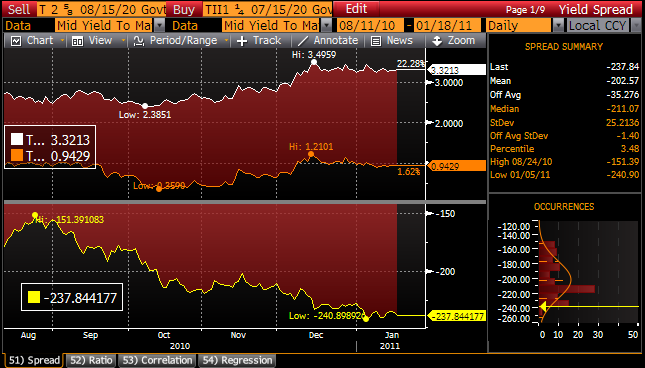 How could anyone not argue that the Treasury market is not distorted by QE? This is another thing that Ben will point as a measure of his success. He’ll eat those words too. There are some powerful forces being whipped up. Lots of records. Too many for my liking. via Inflation expectation up 60% in 6 months – Thanks Ben! | zero hedge.